Are you prepared to take an online class? Online learning will require you to meet certain technical requirements, but it also demands a different set of work habits, a different level of motivation and a different way of thinking about class. Read more below to make sure you're ready. Step 1: Assess your readiness for online learning. Online learning is not easier than in-person instruction. In fact, for some, it’s more difficult. Watch the video to see if online learning is right for you. Make sure that your computer meets the basic system requirements for CCBC online courses. 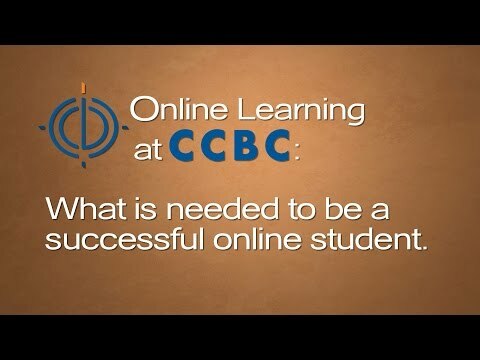 Search CCBC's online courses to find those that interest you. Pay close attention to the course description; many of the online courses are delivered in a "blended" format, meaning that there are required, regularly scheduled class meeting dates, while some may have other on-site requirements. Review the CCBC course format definitions for a full explanation of the various formats. If you are already a CCBC student, meet with your advisor to select the courses that meet your goals and register for your selections. Once you've registered, there's still plenty to do to get ready for day one of your online class. Follow these steps. Textbooks and other required materials can be purchased from the CCBC Bookstore. Most texts are available for purchase approximately one month prior to the semester or session. You can purchase texts either online or in person at any of the three main campus locations. Have your class schedule with you when you order or shop. the campus from which you course originates. Look at the section code; Catonsville-based courses have a section code beginning with WC, Dundalk-based with WD and Essex-based with WE. Each campus bookstore stocks several copies of all texts for all online classes; however, if you're shopping in person at a campus other than where your course originates, the bookstore may have to order it for you. MOL Students: If you are a student enrolled at another community college but taking an online class from CCBC through Maryland Online (MOL), the correct text should be available in your home college bookstore. If it is not, contact your instructor. Log in to myCCBC. If you have not retrieved your CCBC username and created a password, there is a link to a self-help application that will guide you through the process. You need only complete this process once. After retrieving your CCBC username and password you may log in to your personal myCCBC page. On the myCCBC page click on the Blackboard 9.1 link. Log in using your CCBC username and password to access your personal My Bb9.1 page. PLEASE NOTE: Your courses will not appear on your My Bb 9.1 page until the first day of each semester or session unless your instructor chooses to allow access earlier. Contact your instructor if the course content is not visible by the first day of the semester or session. At least 30 percent of your final grade in all online courses must be based on proctored, authenticated assessment. In most cases this means that you will have to come to a testing center for one or more exams. (Exams for blended courses are usually administered during a scheduled classroom session.) The course syllabus will outline testing dates and requirements. Testing Centers are located on each of the three CCBC main campuses as well as at the Hunt Valley, Owings Mills and Randallstown centers. If you plan to be outside of Baltimore County during the semester, you may request approval to have your exams proctored at an institution near your location; local colleges, public libraries and commercial education centers such as Prometric will often provide this service. Some may charge a fee. Arrangements for out-of-county testing should be made before the course begins, if possible. Learn more from the CCBC Testing Center. If you have any problems, questions or concerns about your login or other technical issues, go to the CCBC 24x7 Help Desk. Here you will find solutions to most of the frequently asked questions, or you can submit an electronic ticket to request assistance. If you cannot find a solution for a technical issue, you can also email the CCBC Help Desk or call 443-840-HELP (4357). On the first day of the term, log in to Blackboard. In the Course List, click on the course title to access the actual course content. Once you have successfully accessed a course, any questions or concerns about the content or how to navigate it should be directed to your instructor.